square type cooling towers have broad spectrum applications like A/C Plant and cold rooms, Chemical industries,Blow moulding, Aluminium die casting m/c,Dairy citrus and other food processing units,Glass manufacturing plants,Oil refineries,PVC pipe manufacturing units,etc. 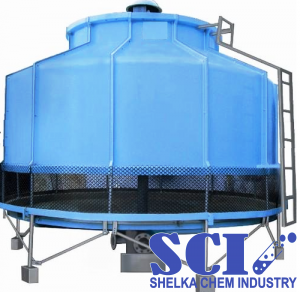 CAPACITY-SHELKA CHEM manufactures cooling towers of 10 TR TO 1500 TR with water flow from 5m3/h to 1000m3/h along with temp. drops from 5 to 20 degrees. This is also desiged to cool industrial re-cycled process water from temperature of 49.5 to 4 degrees along with already existing Wet Bulb temperature of the region. Applications – like A/C Plant and cold rooms, Chemical industries,Blow moulding, Aluminium die casting m/c,Dairy citrus and other food processing units,Glass manufacturing plants,Oil refineries,PVC pipe manufacturing units,etc. Shelka chem puts special attention to the quality of f luid coils and makes sure that these should be of international standards. 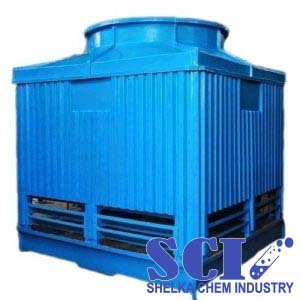 Applications – Dry cooling towers have a great rang of applications like steel casting foundries,power generation units, rubber industries,gas generators , diesel generators,steel plants ,heat treatment furnaces etc. These are eco friendly and cost effective as it eliminates the descaling chemical costs,maintenance costs are minimum. 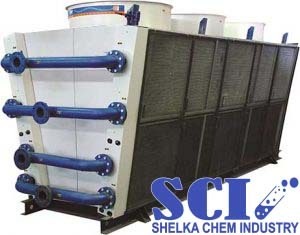 Modular Cooling Towers ,Evaporation Cooling Towers ,Natural Cooling Towers are customised. 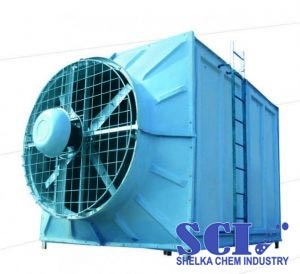 Shelka offers super grad Industrial Chillers as per the specific demand of our esteemed clients. 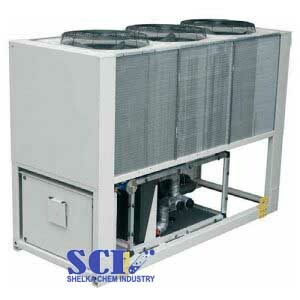 Copper is the element which we prefer to be of refrigerant tubing system of our chillers. Super efficiency and insulation . Control & safety is audio visual indication.